"Not your ordinary burger. A little brown sugar for sweetness and a kick of salsa make these mouth watering. Kids will love them!" In a medium bowl, mix ground beef, diced onion, chunky salsa, ketchup, brown sugar, egg, oats, salt and pepper. Form the mixture into patties. In a medium skillet over medium heat, fry patties 4 to 5 minutes per side, or to desired doneness. 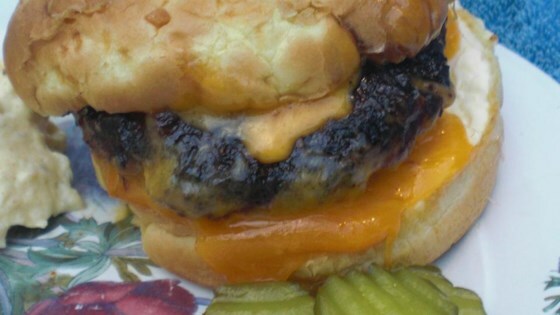 See how to make a perfectly cooked hamburger. The only thing I did different to this recipe was...I TRIPLED the beef! And they were good, plus they held up very well in the frying pan. Yum, tasty! Too much moisture. Kept falling apart,but very tasty, so I threw it in a loaf pan, baked it for an hour and we ate meatloaf! This was a disaster and a total waste of good hamburger. The patties were runny, no way to form them into patties. Do not try this recipe. Not too fancy that is for sure! It was a mess. Fell apart, burned, way to sweet. Sounded good on paper but was really a disaster! I'm glad I only made a small batch of this for the kids. It was a sloppy MESS! They didn't even like it. I couldn't stand the smell of them cooking. Just didn't work out for me. While the flavor wasn't hideous, the burgers wouldn't hold together, and they burned before they were done even on lowered heat. Won't be trying this recipe again.